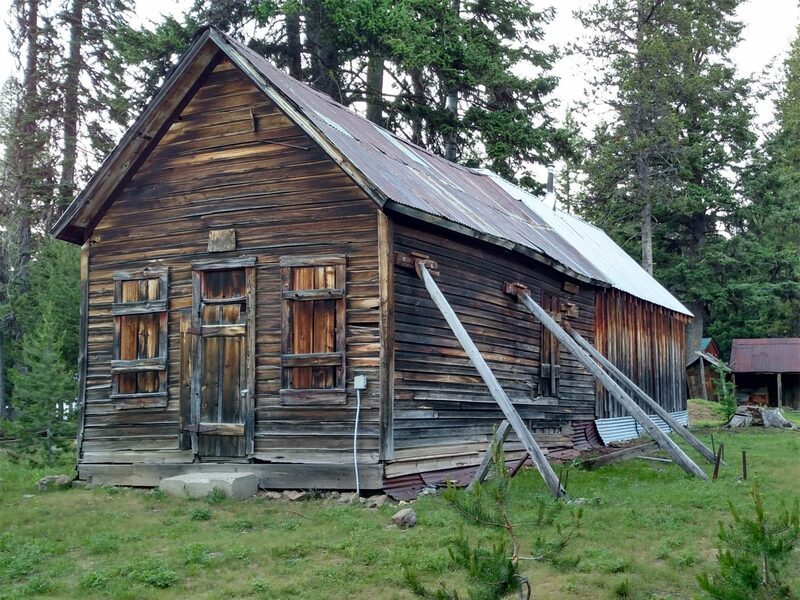 Visit Sumpter to experience the history, mountains, ghost towns and trails for yourself. But be careful! If you catch the spirit of freedom and adventure once embodied in the rugged miners and toughened loggers of old, you will want to create a few adventures (and make a few memories) of your own. What is the Sumpter Valley Gold Dredge? The Sumpter Valley Gold Dredge is an impressive piece of mining equipment that wound its way through the neighboring Sumpter Valley, digging up the earth as it went. Essentially a ship sitting in the middle of dry ground, the dredge was able to travel in a pond it created for itself with its 72 massive dredging buckets processed 9 cubic feet of material per minute. The leftover material was then dropped out the back of a 96-foot long conveyor belt, leaving piles of gravel tailings everywhere it went and scarring the landscape forever. 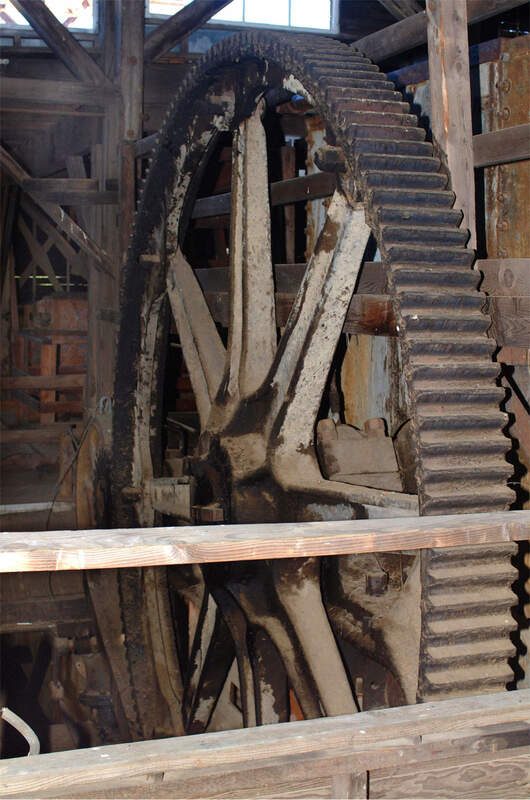 The dredge operated continuously, 24 hours a day, 7 days a week. Christmas and Fourth of July were the only observed holidays. 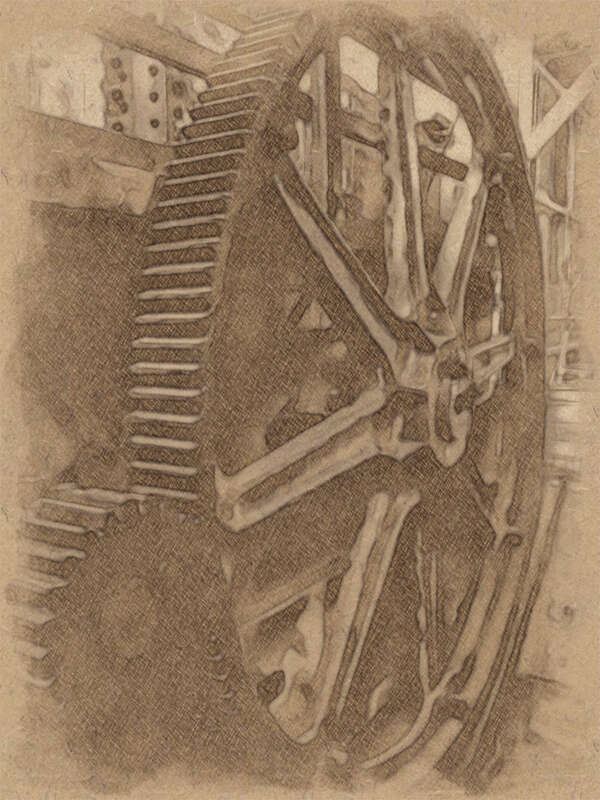 A total staff of twenty-four was necessary to successfully run the dredge while it took a team of three men to operate the dredge at any one time. A world war was one of the few disturbances that halted the dredge’s progress. 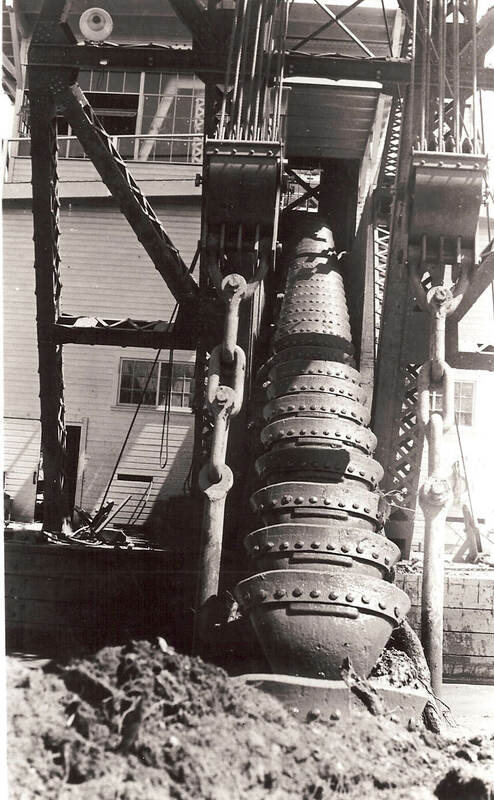 Aside from that 3 year layover, the dredge operated almost non-stop from 1934-1954. Nestled among the hills of beauty, with the swelling mills on every wind, and the thunder tones of destiny proclaiming a great future with equal clearness, Sumpter may be proud. – From “Cradle of Wealth,” a pamphlet produced in the early 1900s extolling the virtues of Sumpter. Who Are the Friends of the Dredge? 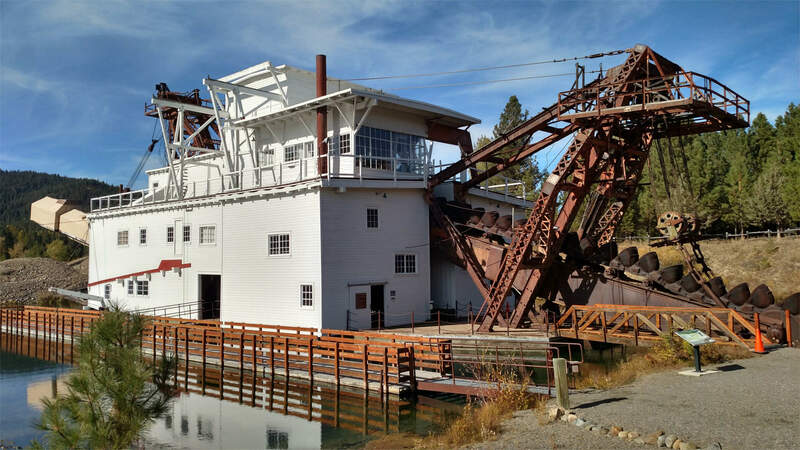 The Friends of the Sumpter Valley Dredge, a non-profit working alongside Oregon State Parks, is dedicated to the preservation and restoration of the historic Sumpter Valley Dredge. 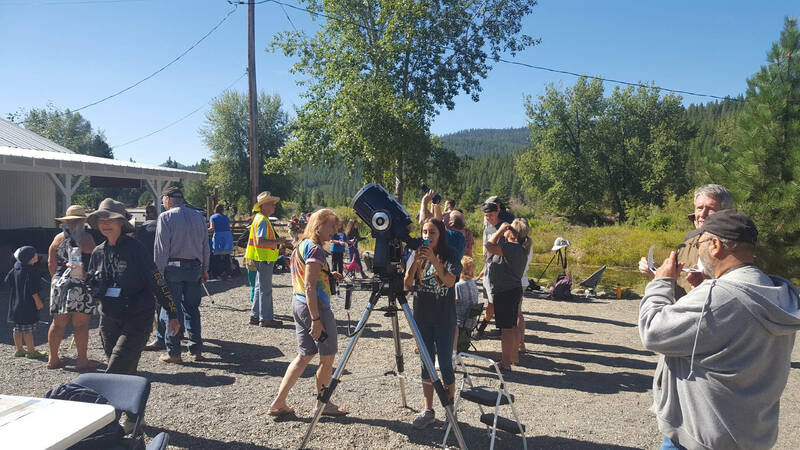 Our Mission: Friends of the Dredge provides educational and interpretive experiences at the Sumpter Valley Dredge State Heritage Area for the benefit of present and future generations. Partnering with Oregon State Parks, our goal is to help protect and preserve the outstanding resource which is the Sumpter Dredge. 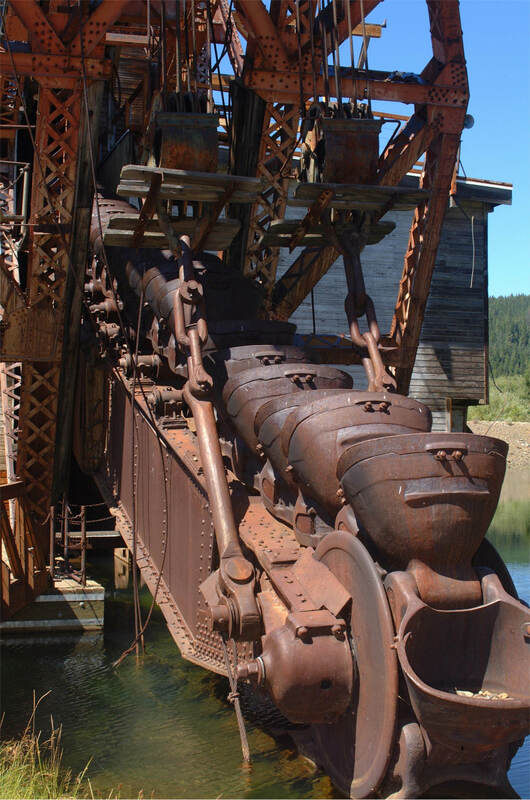 Today, visitors are still amazed at the impressive feat of engineering embodied in the dredge as they visit Sumpter Valley Dredge State Heritage Area. The dredge is now surrounded by several well-maintained hiking trails, an interpretive center, and informational kiosk stations. One can still enter the dredge and touch, taste, and smell just a little bit of that era gone by. But there’s a problem. The dredge has sat in the pond it created for itself for 40 years without moving an inch. The hull is in deep need of repairs. The budget needed to keep the dredge in peak condition is estimated at $850,000.